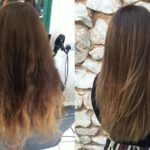 Are you looking for Hair Straightening in Exeter? Get Beautifully Smooth Hair With Our Kerasilk Treatment in our Exeter Hair Salon! Our client came in to see Sacha for the ultimate in Keratin treatments; Kerasilk by Goldwell. The Kerasilk Keratin Treatment provides long-lasting transformation into perfectly smooth and soft hair for up to 5 months. Sacha also used a stand alone Olaplex treatment prior to help with the integrity of the hair. Finally she finished of the treatment with a style using her GHD Platinum Stylers. As you can see, the results are simply fabulous! Would you like beautifully smooth hair? For anyone who is regularly blow-drying, over-using straighteners and overloading their hair with products in order to control their hair, this is the treatment for you!